Happy anniversary, Tiger & Bunny fans! It’s been a year since we got sucked into Sternbild. And even though our wallets are suffering, we just don’t want to leave yet… so here’s to another year! From shukamu. “First picture: The BEST OF HERO album is the only official T&B merch I have. Usually the high shipping costs discourage me from buying stuff, but I liked the samples I heard so much I decided to buy the album. Best purchase ever. Second picture: Somebody made the rabbit plushies and held a raffle for two of the plushes she made. I was one of the winners, and I’ve had it since the show ended. Everybody in my suite loves him. From Kitarin & BL-chan. “There was no way we could make up our minds, so have a few of our favorite things~! <3"
From Mengsi. “Heard the voice of Thanatos <3"
From MeisterGao. “Would had attached my home-made bunny plush but the cats were sleeping on it! The burnt banner was made by a friend of mine and I keep it safe! My favorite item has yet to be finished, but my Kurayami who is visiting said they will bring it with them when they visit! (It’s the Lunatic tie ❤ )"
I think it’s more entertaining that our Photos are right after one another’s…. That’s quite a coincidence! I put the photos in a random order, not the order they arrived in. It is quite a coincidence, still entertaining since that was the Kurayami I was referring to. 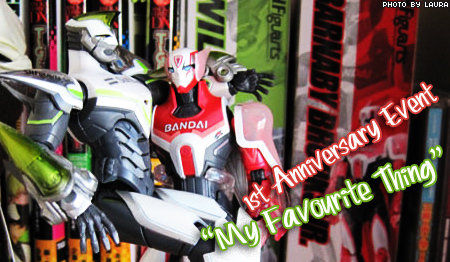 Happy anniversary Tiger & Bunny! 😀 There is so much awesome T&B stuff! Oh the joys of being a Tiger & Bunny fan :3 Only TB fans will truly know how remarkable the experience is of being obsessed with one of the greatest animes of our generation.